- Products - Global Kiosk Systems Ltd.
With over 1.5 million guest visiting the property every year, the Opryland Hotel is one of the top tourist destinations in Tennessee and the entire Southeast. Steeped in tradition, this facility caters to a wide range of guest ranging from conventions and meeting attendees to the lover of Country music. While doing so, the Opreyland Hotel delivers an experience like no other in the United States. With the constant growth in the meetings, conventions and tourisim industry along with 3 new facilities comming on-line in the next few years, The Opryland Hospitality Group began in early 1999 looking to Self Service as a way to enhance the customer experience and maximize the comany's resources. The initial Project identified the sale of Opreyland complex and Airport ground transportation products. In the past, transportation ticketing has been attendant provided at a traditionally manned kiosk at both the Airport and in the Hotels Magnolia lobby. The project goal was to provide 24/7 access for ticket purchase, reduce the long line-ups when large groups arrived and offer credit card transactions in order to decrease the time to purchase. 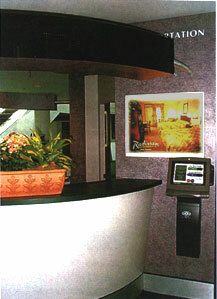 Gaylord contacted Global Kiosk Systems in early February of 1999 to discuss the possibilites of a Self Serve application. After an initial review of the project requirements, three kiosk modules offered by Global would meet the project goals. They would use a customer interface for the product request, a transaction module for credit card processing and Global's Watchdog for monitoring both the Kiosk, it's consumables and the global software package. The Ncr 7401 hardware platform was chosen for it's high level of integration, reliablity and the NCR product support program for after sale service. The traqnsaction portion would be handled by Symphony Products. Symphony offers a wireless solution using CDPD technology for transaction processing. The wireless capability enhances the placement opportunities for the kiosk and impacts the time to depolyment, as the need for any dedicated banking lines is eliminated. Integrating both this technology and the existing Global Kiosk package proved to be a winning combination. Opreyland took delivery of its solution in less than 5 weeks from the final specifications being approved. Since that time the application has captured more than 20% of the daily total for ground transportation tickets being purchased at these locations. Customer response has been favorable as guests see the self-service kiosk as an added benefit to their stays experience both in the convenience, ease of use and the time saving factor. The project manager for Opryland, Mr. Rod Armstrong says "The entire package offered by Global Kiosk has been a great success. Global and their partners were able to meet our very aggressive instalation timeline while providing a product that has been both well recieved by our guests and virtually maintenance free". Given this programs intial success, Opryland is now considering self-service as a key component in their customer service strategy. This application has had a positive impact, and will contribute to the Opreyland Hospitality Group's mission, which is to be the premier hospitality destination, providing quality entertainment experiences that create a positive difference in people's lives.